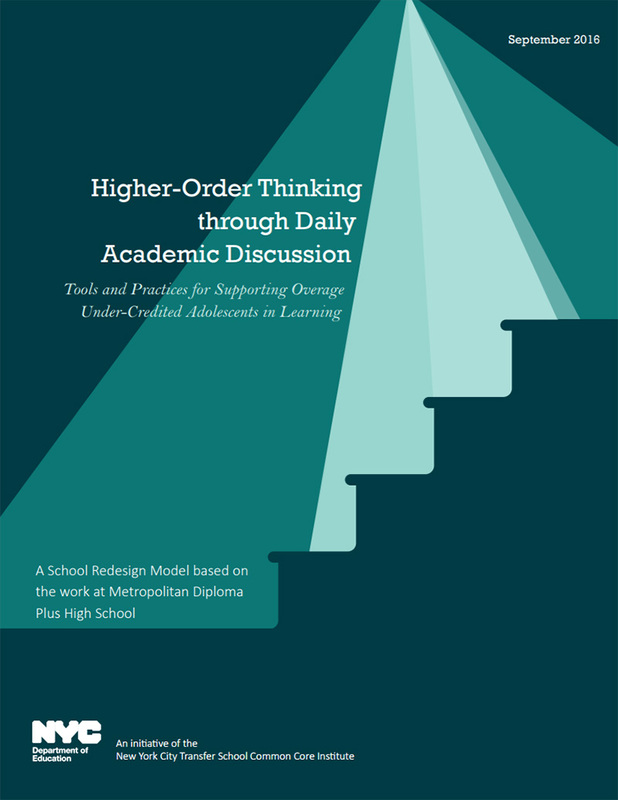 Higher-Order Thinking through Daily Academic Discussion describes how Metropolitan Diploma Plus High School (Metro), a transfer school in Brownsville, Brooklyn, put students at the center of their own learning by providing frequent opportunities for them to discuss texts, concepts, and their own thinking processes with one another. By focusing on speaking and listening skills, teachers helped students better understand complex texts while also enhancing important critical thinking skills, such as analysis, evaluation, and synthesis. This in turn led to increases in pass rates on state exams in English (+7%) and U.S. History (+16%). This report provides detailed descriptions of the steps and structures Metro teachers developed to support students’ speaking and listening skills. These tools include rubrics for speaking and listening and writing; sentence stems to promote metacognition and accountable talk during in-class discussion; self-monitoring worksheets for students to set goals and keep track of their own progress; and a discussion tracker for teachers to quickly gather observations on student skills during class.